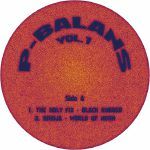 Review: P-Balans is a new imprint in the Future Nuggets emerging constellation. A tehnodelia ramification within the Bucharest electronic scene that will host rising names like Khidja and Borusiade while introducing new characters like The Holy Fix (Camil Dumitrescu, co-member of Delusion Men) and Utopus (Ion D, producer of Steaua de Mare, Raze de Soare, Anahore?ii among others) already featured on "Sounds on the Unheard from Romania vol. 2". Keeping the same strategies of fusion and diffusion as Future Nuggets, P-Balans will explore the space traversal to techno, entering and exiting the dark halls of the club through multiple doors.